Chillingo, a leading publisher of iOS games, revealed its winter lineup on Thursday. The exciting collection of games augments an already impressive lineup that spans across genres and demographics. Look for these games on the App Store in the coming weeks. Fans of old school shoot ‘em ups will enjoy Chillingo’s latest top-down combat simulator, Sky Combat. Due out in January and developed by Alien Worm, this retro title is reminiscent of 1942, the iconic arcade shooter that defined the genre. 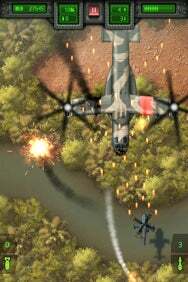 In Sky Combat, you’ll fight your way through 30 different enemies and 8 different bosses all while using 3 different craft: An AH-64 Apache helicopter, a combat boat, and an M1 Abrams Tank. Like any good shoot ‘em up worth its salt, you’ll be able to find missiles, bombs, and upgrade your arsenal. The game incorporates much of what Chillingo has learned about the iPhone device. You’ll be able to touch, tilt, and use a virtual joystick to maneuver your craft throughout the levels. Paired with an engrossing soundtrack, great 2D graphics, and Crystal integration, Sky Combat looks like a title fans of old school gaming won’t want to miss. TxT Fighter lets you defeat your foes with your superior typing skills. Yes, you read that right. This “text-‘em-up” developed by 5 Elements Entertainment is a fighting game complete with a full cast of characters with special moves. But the unique gameplay element here is the input keyboard on the bottom of the screen that allows you to type words in order to initiate fighting moves. You don’t punch, kick, or headbutt without first typing in the word that appears on the screen—ensuring this is the most education-friendly fighting game you’ll ever play. The game offers six characters, six stages, two mini games, and lots of achievements and unlockables. The art style is cartoonish but the gameplay is remarkably varied. During the demonstration, we found the virtual keyboard at the bottom of the screen to be a breeze to use. Not only can you type in a small word to do a quick, weak attack, but there are also options to do longer, more complicated words for more powerful attacks. Of course, these attacks take longer to type and leave you more vulnerable to your opponent’s moves. So there’s a great deal of strategy involved as well. TxT Fighter and TxT Fighter HD come with full Crystal integration, allowing players full social networking capabilities with leaderboards, stats, and achievements. Look for this title to be released on the App Store December 16th. This January, the Witcher is coming to your mobile device. 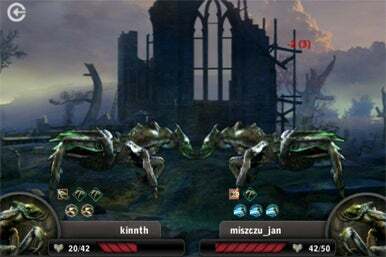 Based on the successful online browser-based role-playing franchise and series of novels, The Witcher: Versus is a turn-based strategy game pitting you against an opponent in an epic fantasy setting. You’ll have three classes to choose from including Witcher, Sorceress, and Frightener and many different skills and spells to unlock and level up. The gothic-feel of the game is evident in everything from its art to its morbid menus. Like any good RPG, you’ll be able to customize your character and embark on quests to gain loot like weapons, amulets, and magical items. According to Chillingo’s press release, players can compete and challenge others playing the online browser and WAP versions of the game for an unparalleled MMO dueling experience. You’ll also be able to post your high scores and achievements using the integrated Crystal platform. 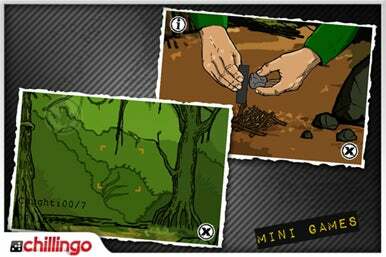 On Thursday, Chillingo released Bear Grylls: The Bear Essentials. Developed by VeeMee, the lifestyle app features the star of the hit Discovery Chanel show, Man vs. Wild. Like the television show, the application will teach valuable survival and safety skills that are potentially life-saving, should users find themselves lost in the wild…with their iPhone. Ideally, users won’t find themselves in situations that call for Mr. Grylls’ advice, but if a camping trip happens to take a turn for the worst, users will be able to rely on the information and safety tips packed into Chillingo’s multifaceted application. In addition to mini-games and wilderness quizzes, The Bear Essentials will also feature interactive instruction manuals, and an adventure photo gallery. Should users actually find themselves lost or stranded in a less-than-desirable location, shaking the iPhone will launch the app’s survival mode which features a watch, compass, and flashlight (yes, calling for help on said phone would be helpful too). The app looks to be a mix of both light-hearted appreciation for the wilderness and serious information Bear has gleaned from his time in the British Special Forces. Of course, no one plans for disaster, but if the survival guide instills any skills that come to memory during emergencies, then spending some time exploring Chillingo’s new app could be time well spent. Additionally, fans of the candy-hungry creature Om Nom from Chillingo’s Cut the Rope will be thrilled to learn he’s back for more. This month, the popular physics puzzle game developed by ZeptoLab makes a return in a standalone Christmas version of the original. 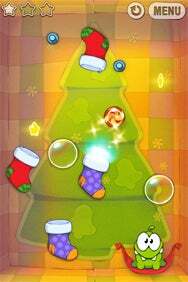 In Cut the Rope: Holiday Gift, players will collect stars and feed candy to Om Nom, accompanied by holiday-themed music. The graphics of the game also received a festive update; Om Nom sports a pair of reindeer antlers and Christmas trees, stockings, and Christmas lights adorn the box he lives in. The free game features 25 new levels and added elements of gameplay and will launch in the App Store by Christmas. Chillingo also plans to release new iPad game Neon Battle HD in the coming week. Developed by laXarIS, the arcade style shooter game charges players with simultaneously protecting their own base as they bombard enemies with firearms. 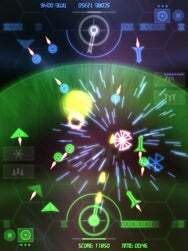 During battle, you can collect points and bonuses to increase your score, all the while wreaking havoc on others by means of lasers, rockets, and bombs. The games’ graphics are neon multicolored, but still seem simple and refrain from overpowering the game play itself. Still, the high definition visuals look great and offer a retro vibe to Neon Battle HD. Single and multiplayer options are available on the iPad, and Neon Battle HD is fully integrated with Crystal leaderboards. The game will be available December 16 in the App Store.